Siney Tarn sits on the patch of high ground between Eskdale and Miterdale, on the wet plateau of Sineytarn Moss. 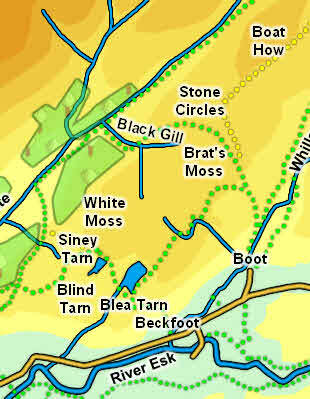 The easiest way to reach Siney Tarn is from Beckfoot in Eskdale. Follow the path that climbs steeply up the hillside to Blea Tarn. The path passes the western end of this tarn and rises up a more gentle slope towards the area that holds both Blind Tarn and Siney Tarn. The path runs past Blind Tarn and up to the southern end of Siney Tarn, then turns right to pass by the eastern end of the tarn. The tarn can also be reached from Miterdale. Cross the Mite at Low Place and follow the path that runs up the valley. After a short distance turn right onto a path that climbs up the hillside in a gap between former plantations. At the top of the climb take a path that branches off to the left heading across the flatter fell top towards Siney Tarn and Blind Tarn. None of our walks visit Siney Tarn. No becks flow out of Siney Tarn, but one does start not far to the north-west, draining Sineytarn Moss into the River Mite.